Many thanks to Tony & staff at Sheffield RSPCA Animal centre off Woodburn Road Sheffield . 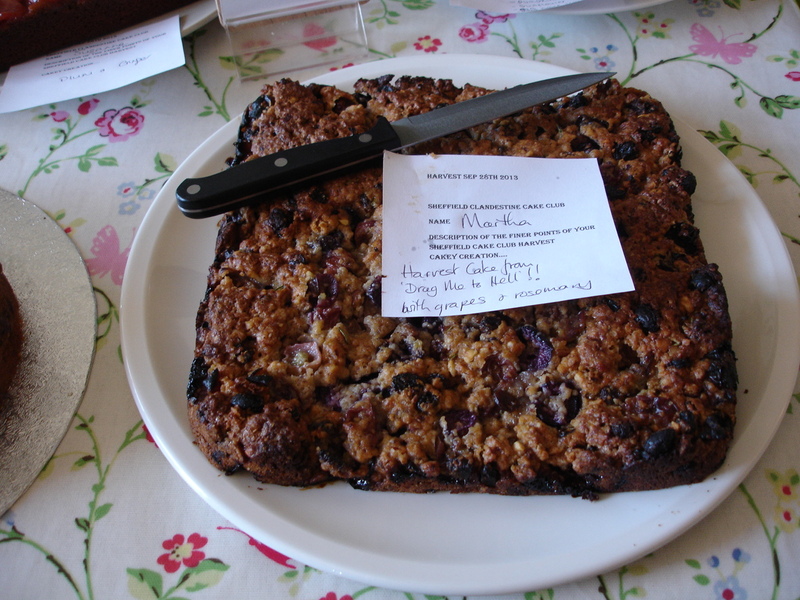 We held our Sheffield Clandestine cake club in the center with 5 bakers & Pepper the dog. Tony told us how they rescue, treat & rehome animals. They do a foster then adopt service to help new owners decide if they can cope with their new pet & offer advice & tips while they settle in. People can view dogs by video & photo now as they found it doesn’t unsettle the dogs as much. This is a proper hedgehog cake by Karen W ! 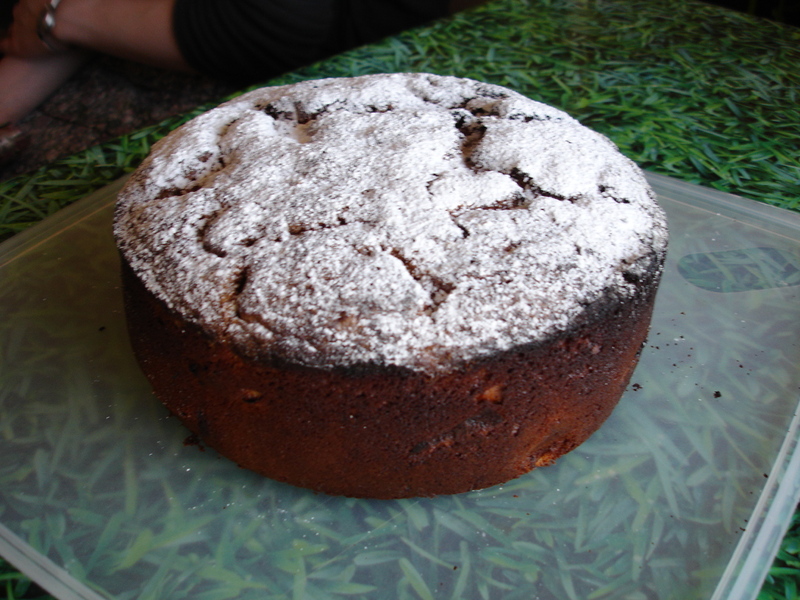 The cake I made had deep rich flavour and an almost treacly taste. #Yummy The carob was supplied by @savvyspreads in Sheffield. 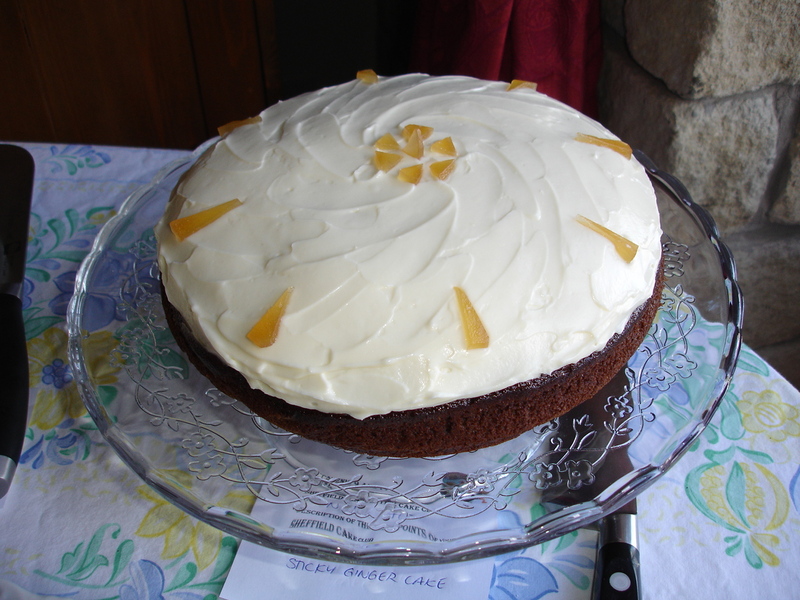 Visit the Clandestine Cake Club website to join the Sheffield group . We meet monthly and new members are always welcome … Come by yourself … We are very friendly ! 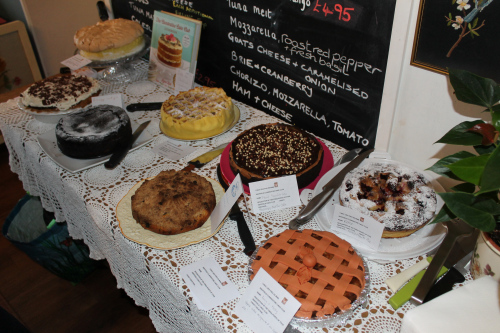 Clandestine Cake Club: Sheffield’s Secret Cake Escape. 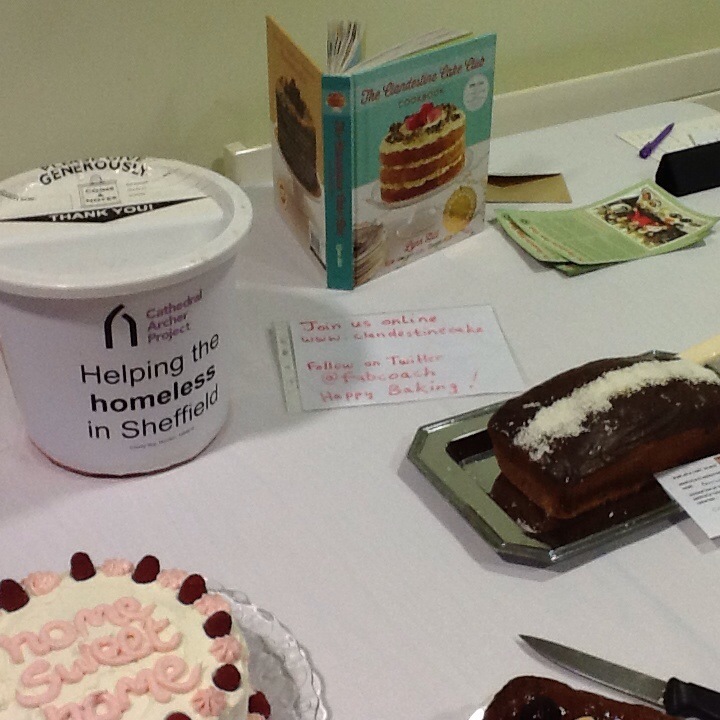 We were interviewed at our last meeting by the new blog about town WhenInSheffield …who summed up the cake club very eloquently ! 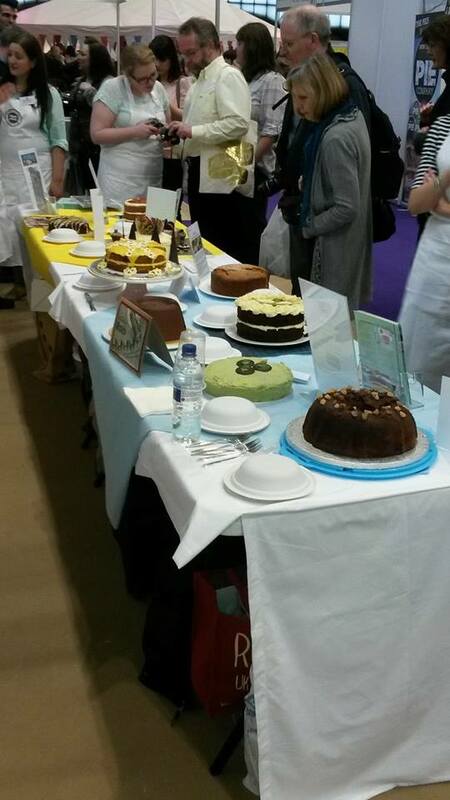 Sheffield & 3 counties Cakenic 2014 was a cakey success ! 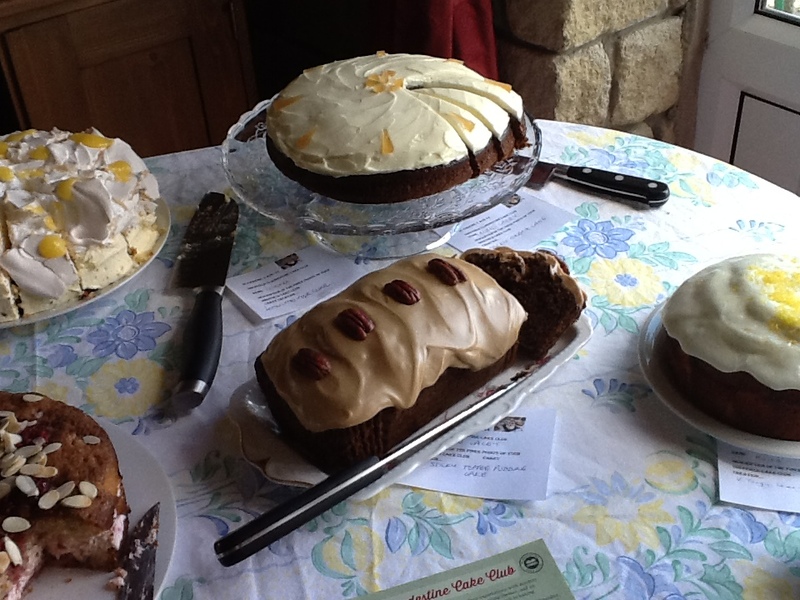 3 Clandestine cake clubs , well in fact 4, met up at Christines house in the balmy Barlborough sunshine . 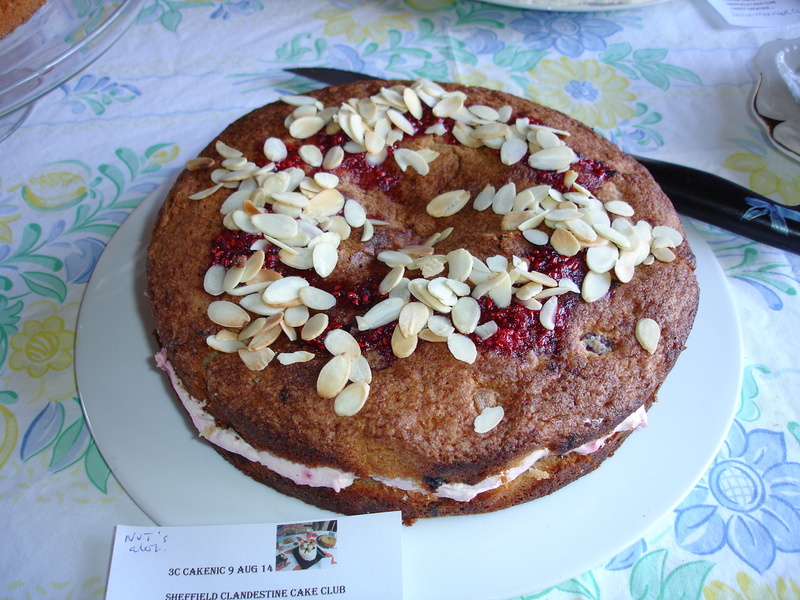 Sheffield, Chesterfield, Newark & Sherwood, and the Loire Valley clubs celebrated our annual 3 counties Cakenic ” picnic with cake ” . Thanks to hosts Christine & Vern who kept the tea and Pimms flowing & held a tombola for NGS Cancer care charities. With gooseberries and lemon thyme from her garden. Moist & delicious. 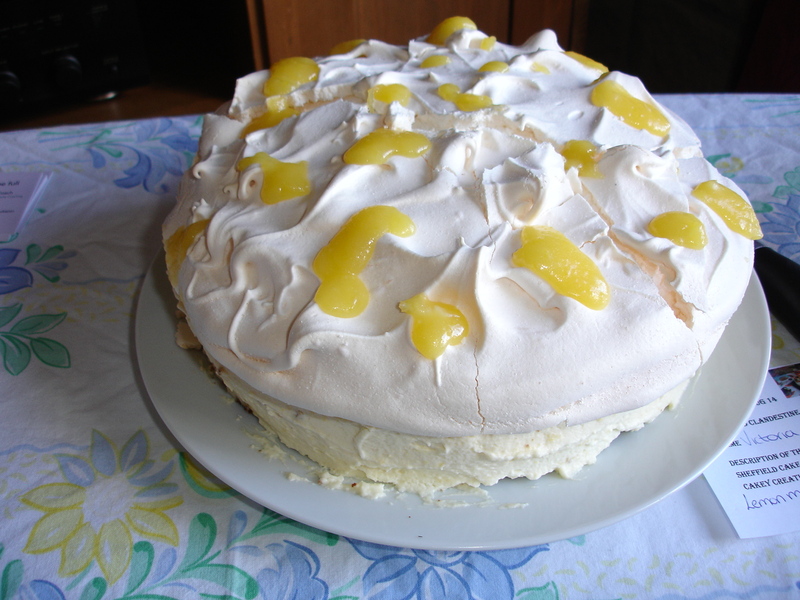 Next was Sticky Vickie’s Lemon Meringue Cake . A Victoria sponge with lemon curd and cream filling topped with meringue and home made lemon curd. 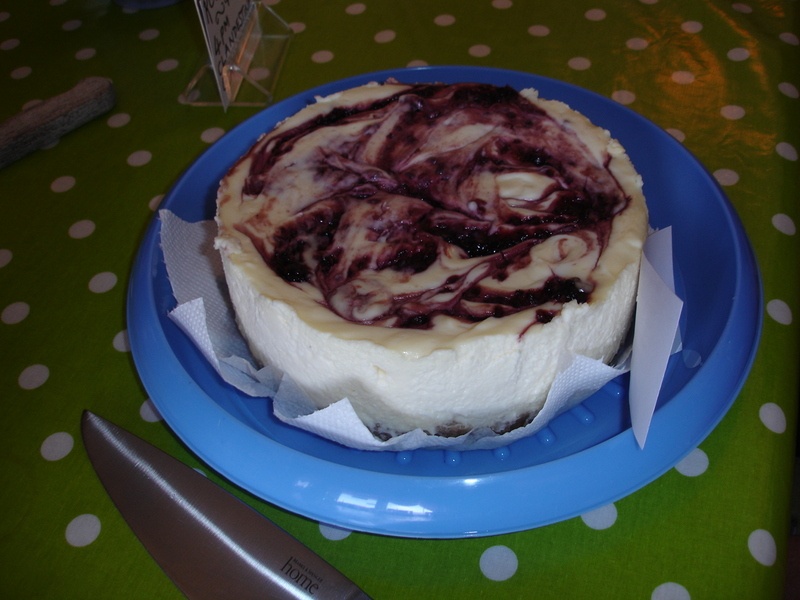 The curd was in fact microwaved so very fast.. recipe to follow on the Sheffield CCC page . My cake was a raspberry & white chocolate sponge cake with chocolate essence . The filling was raspberries whipped with double cream & a spot of icing sugar. I made a raspberry drizzle in the microwave for the topping, just frozen raspberries, sugar & water 50 seconds on high, then sprinkled with toasted almonds . 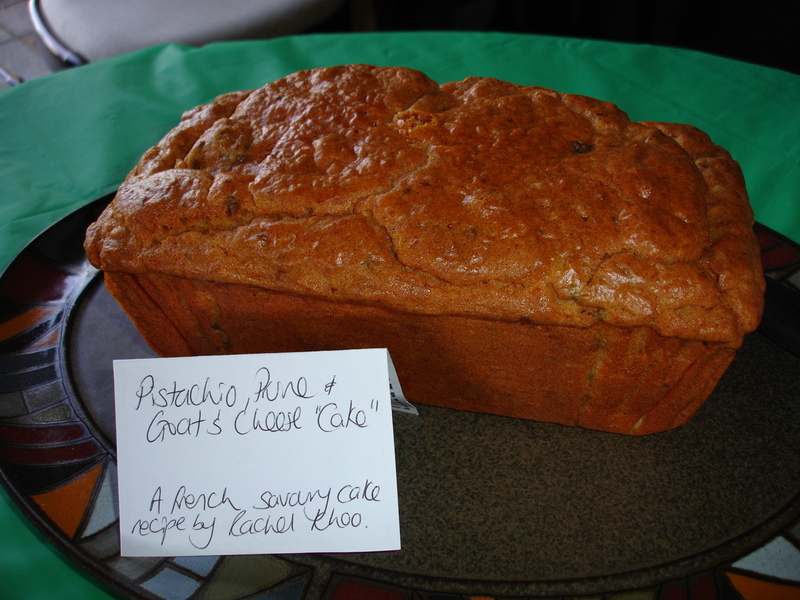 The first of 2 savoury cakes was a Prune , Pistachio and Goats cheese cake from Rachel Khoo s French recipe , baked by Fiona who runs the Chesterfield CCC . 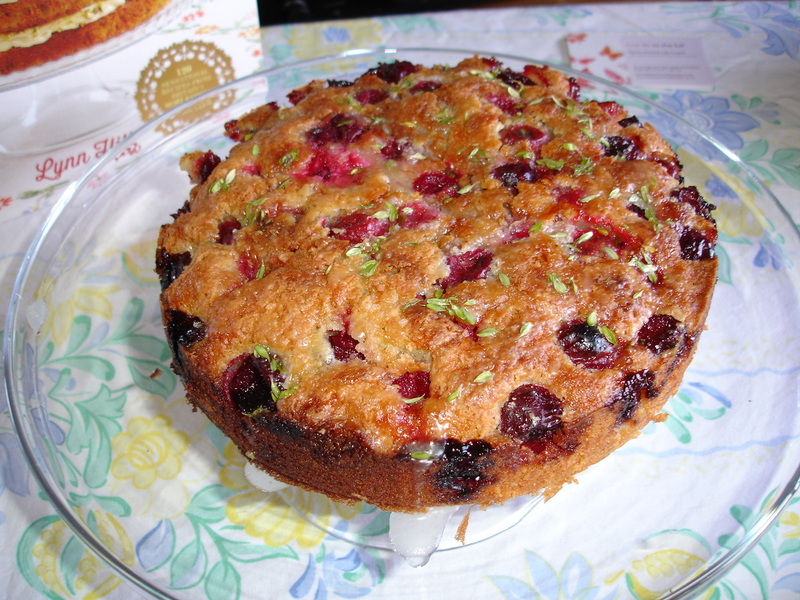 A great picnic cake . 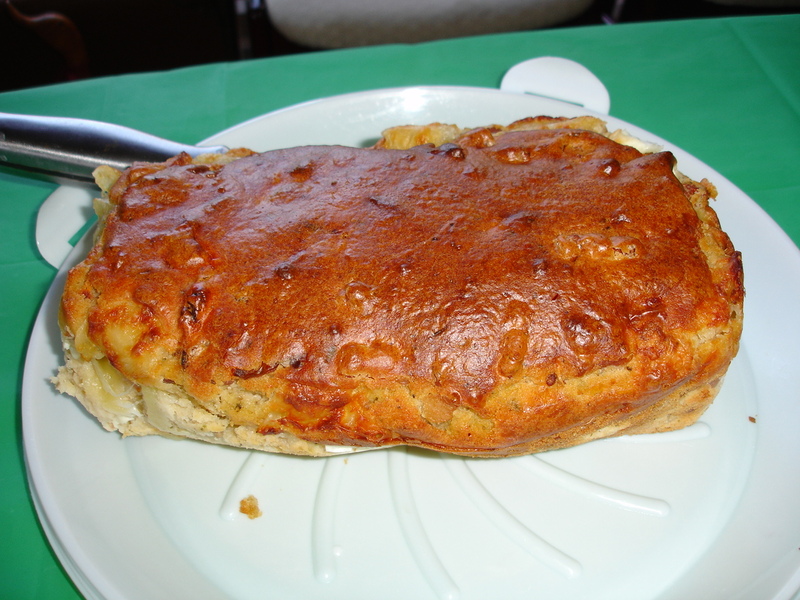 Next up a cheesily decadent Mozerella, Feta and bacon cake by Rosemary , based on Nigella’s community baking recipes on line. The centre just ooozed cheesiness ! 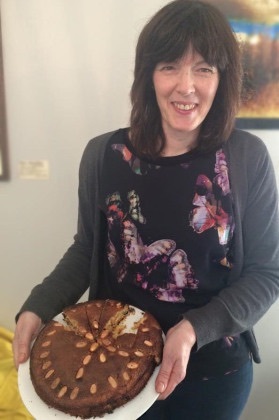 CCC newbie Karen made a yummy St Clements cake with zesty icing. She only heard about the cake club on Weds so is our fastest ever recruit ! 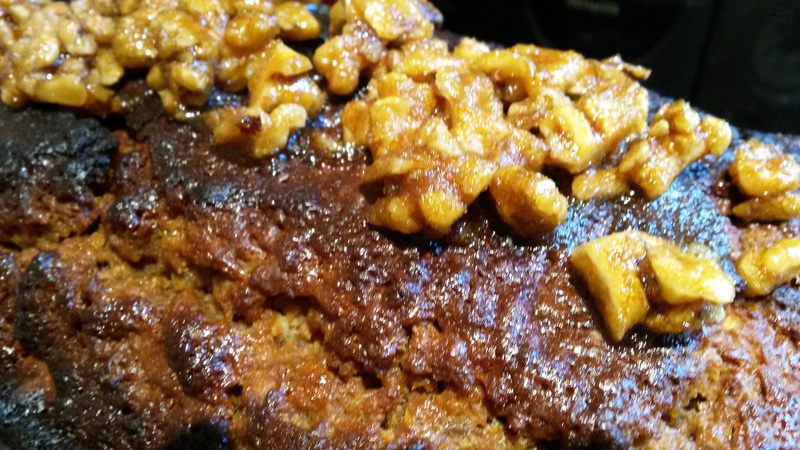 The Loire Valley is famous for its sticky toffee pud cake now !! Thanks to Jean !! Topped with butterscotch topping and pecans. 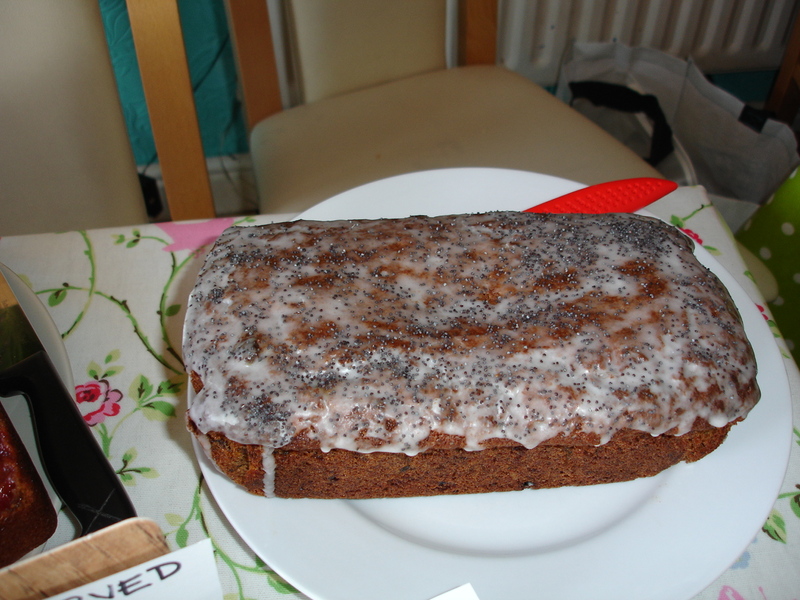 Sticky orange and poppy seed cake with drizzle icing. Lovingly prepared by Liz , and delivered via a massive traffic jam !! 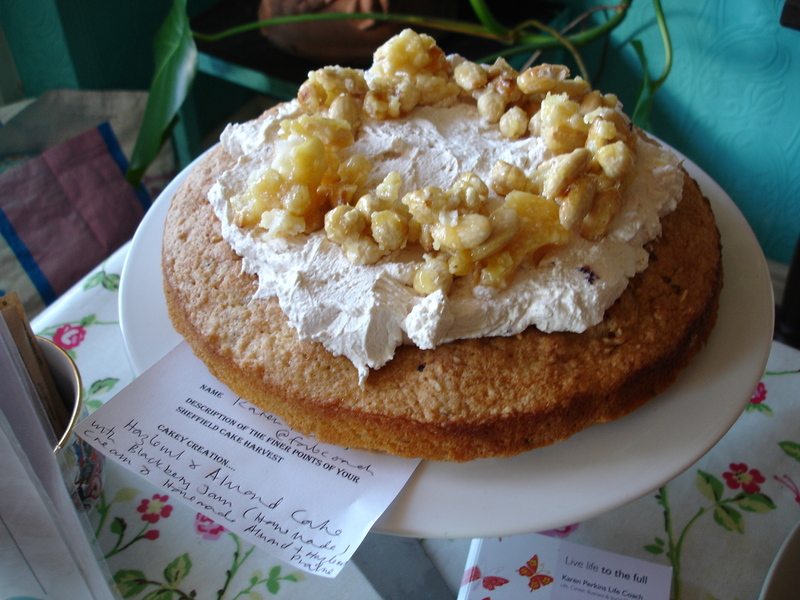 Join us at Sheffield Clandestine cake club ! Our next event is Sat 27th of September and is “Back to school” cakes of your school days, puddings or memories of school baking . Today 10 bakers from Sheffield Clandestine cake Club met at The Archer Project behind Sheffield Cathedral who hosted our event. 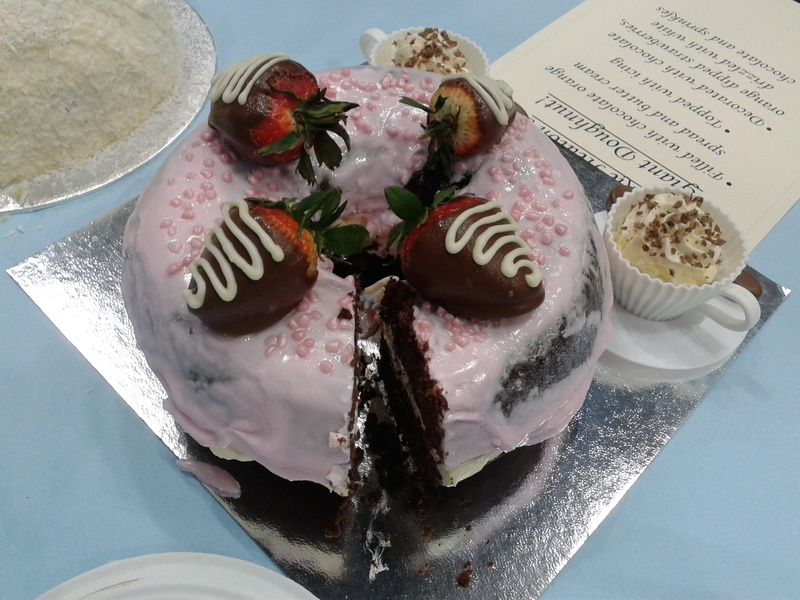 Thanks to Sam who provided tea and tapwater to help us chomp our way through the different cakes . Sam gave a talk about how the project helps people facing homelessness & sleeping rough. 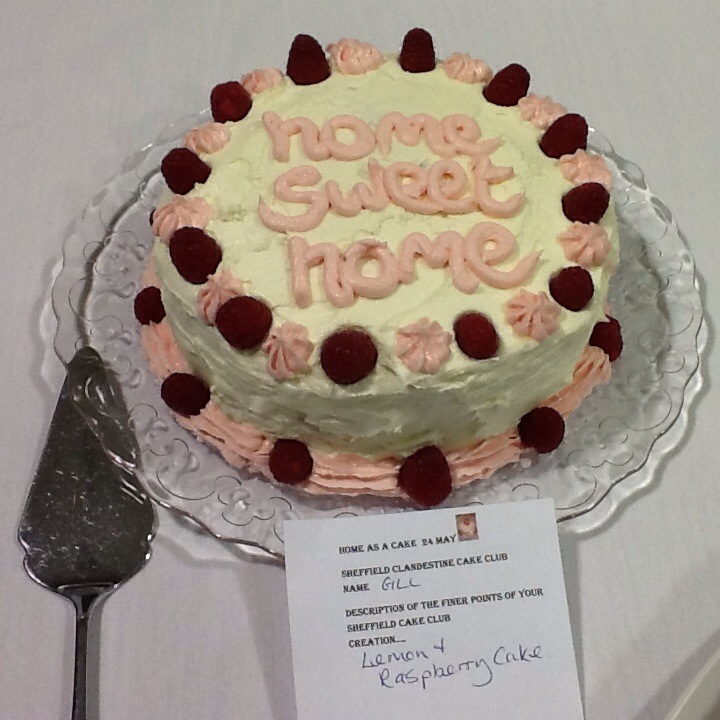 The theme he chose was cakes that remind us of home as home has many definitions and is such a fundamental part of peoples lives. 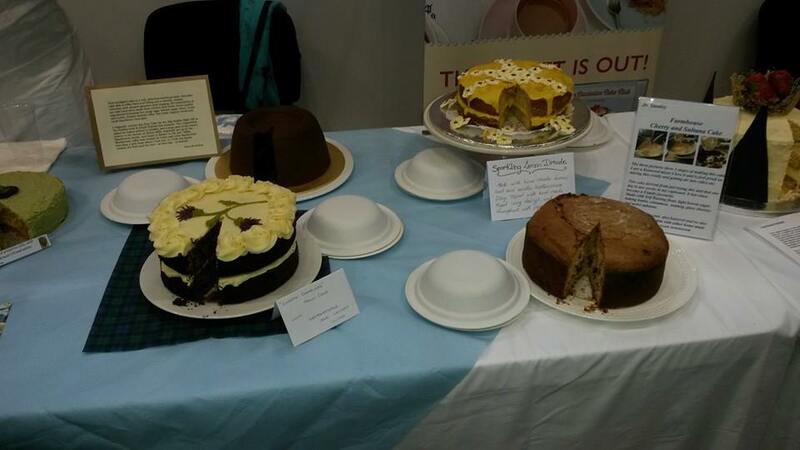 Here are some of the cakes, with the stories our bakers told. 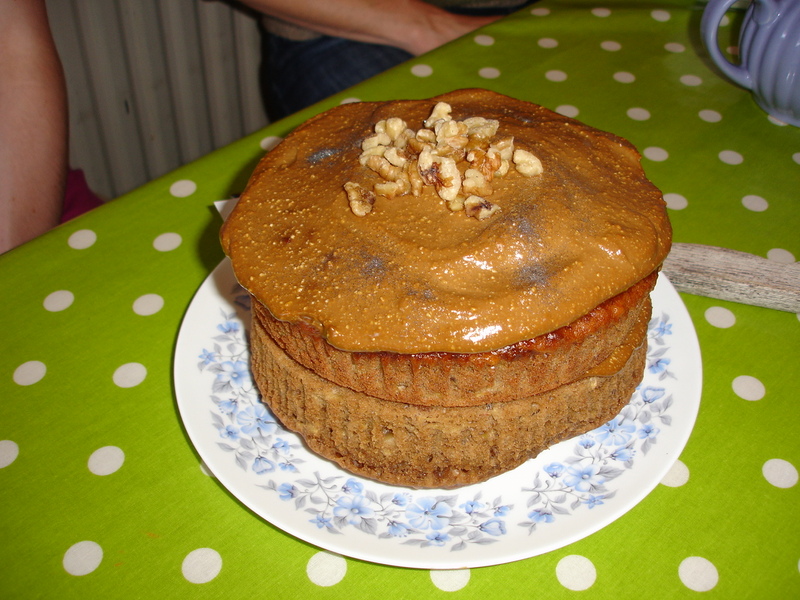 The first cake was a Coffee & Walnut cake which I baked from my mums recipe via Delia Smith . When I was young we only had cake once a week at High tea on Sunday . My mum baked chocolate cake one week, Victoria Sponge the next , then Coffee and Walnut..and back to chocolate !! 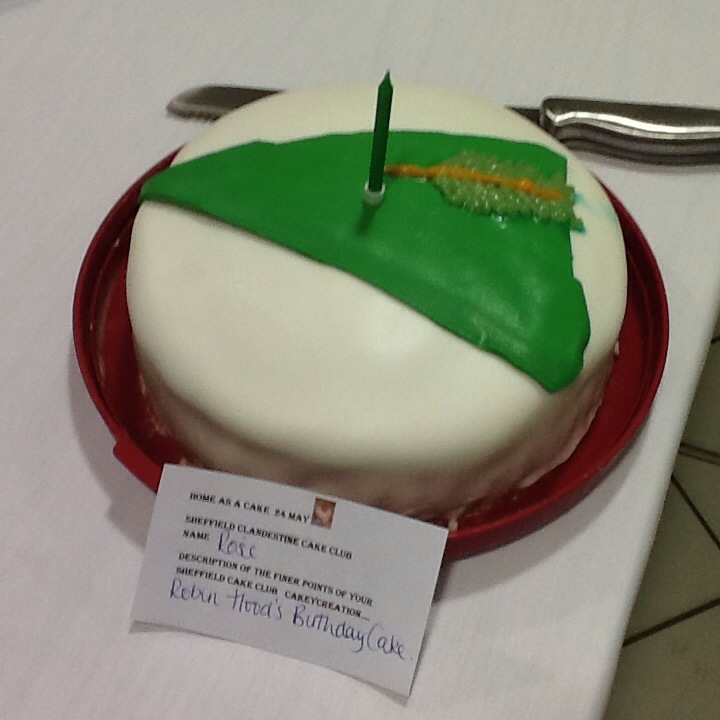 The next cake baked by Rosie was at Robin Hoods Hat cake as she hails from Nottingham. The candle was to remind her that she only had cakes at birthdays when she was young, and that her fondant icing reminded her of birthday cakes at home !! It had a yummy buttercream and jam filling . 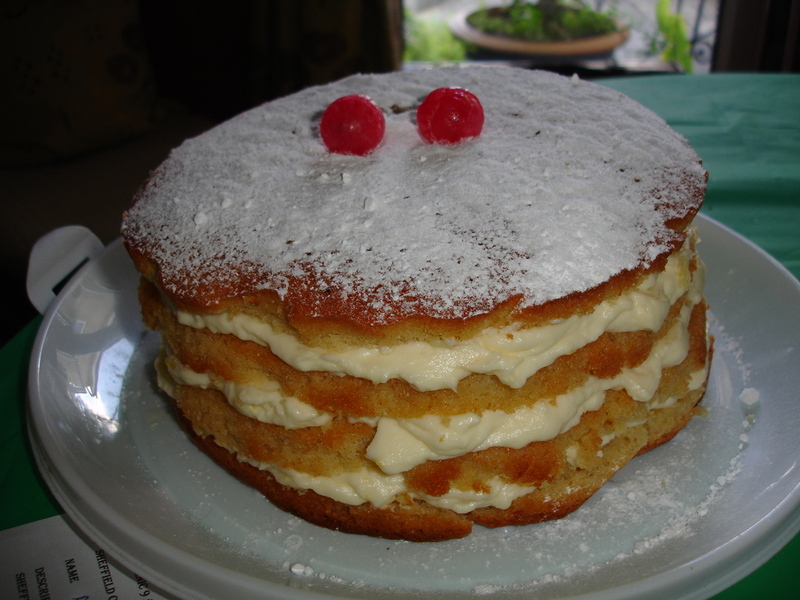 Marys lemon cake was an old family favourite. Her mums lemon buns evolved into what she called ‘lemon finger cakes ‘. We know this now as the good old Lemon Drizzle Cake . Bernie made a coconut cake . 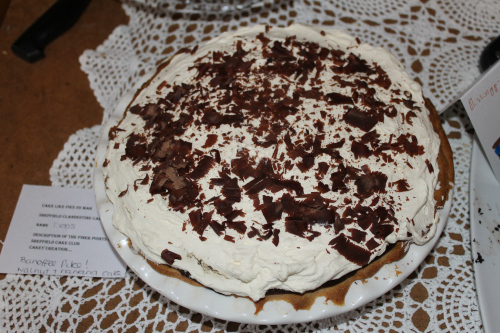 It was a 50 year old recipe from her mum and granny (Age 94 ). Old recipes she said were much simpler than today . The chocolate reminded her of the smell when her mum used to melt chocolate on top of cakes by putting them under the eye level grill ! They always used Bourneville, as that was the only dark chocolate then . 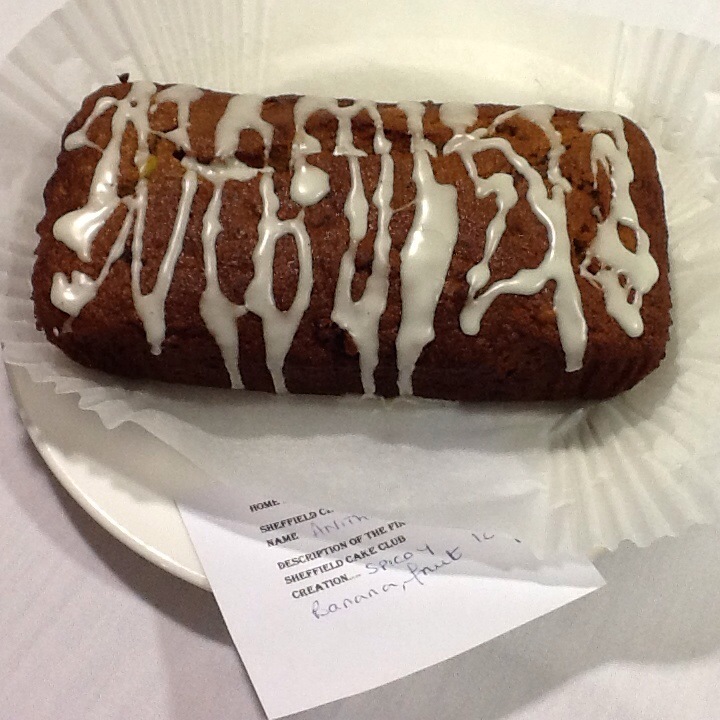 Anita brought a Spicy Banana fruit loaf. Its low fat as has 2 bananas liquidised till smooth. 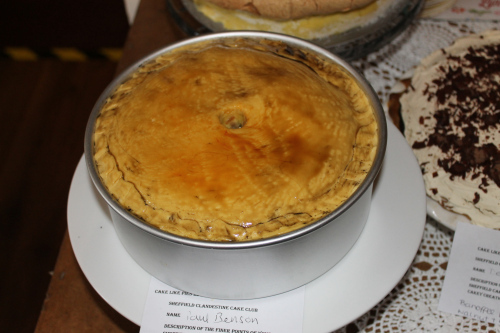 She told us of a local Midlands delicacy of ‘fruitcake on bread & butter ‘ ! 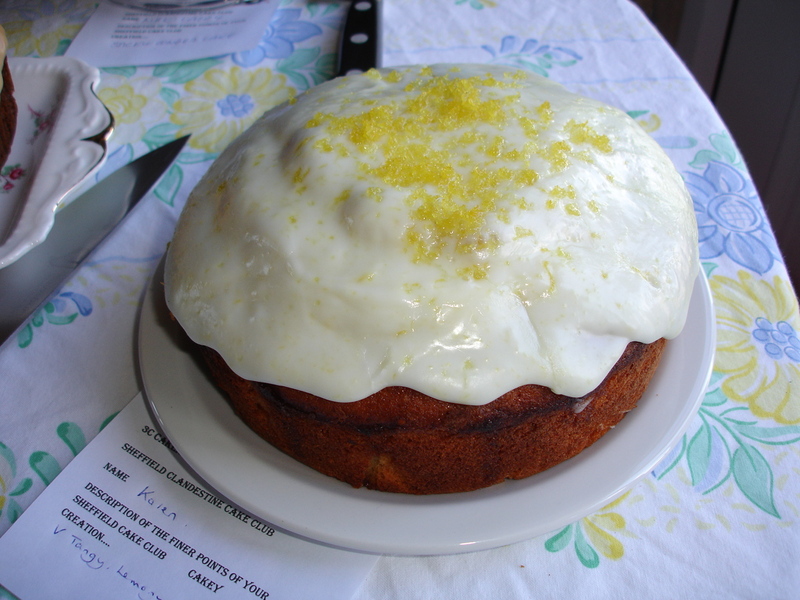 Gill , with an impressive CCC cake debut …told us about baking birthday cakes at home for her 2 kids, one liked Raspberry and the other lemon, so she combined the 2 into one lemon frosted delicacy ! Helens Malt loaf was inspired by her memories of her mum at home , who baked with recipes which were much simpler than today ( a common theme) . Measures were pints & half pints including raisins. 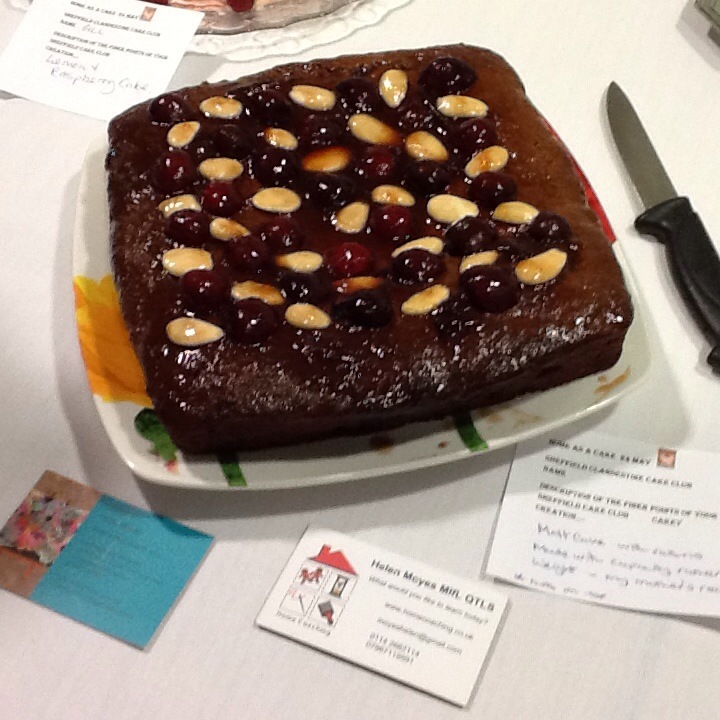 The cherries and almond topping were from her childhood memories . 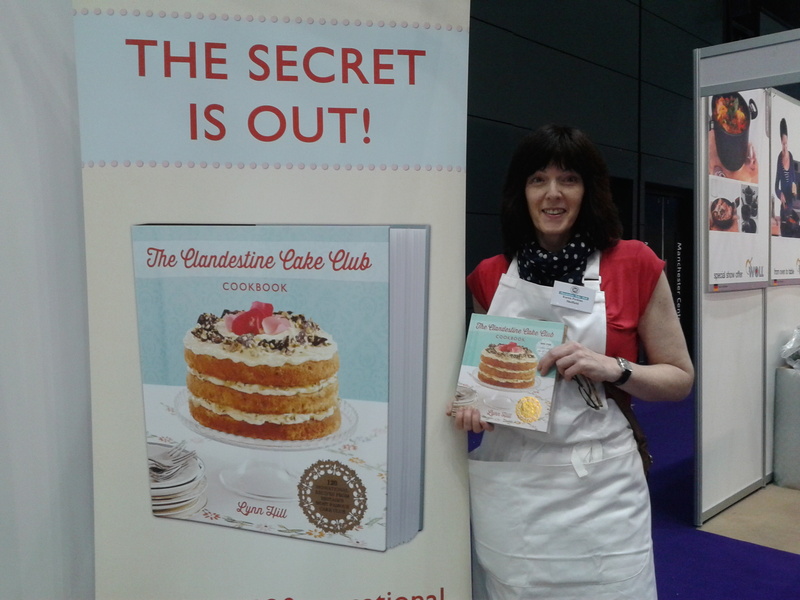 Just to say Bakers are invited to submit recipes for the Clandestine cake Club Vol 2 . Look on the CCC website for details and deadlines . http://clandestinecakeclub.co.uk/groups/sheffield/ Look t the left hand column. We also had a visit from Video journalist Danielle Hayden who interviewed and videoed the group ! Link to follow !! See you all there … Follow me on Twitter @fabcoach for updates on next events !! 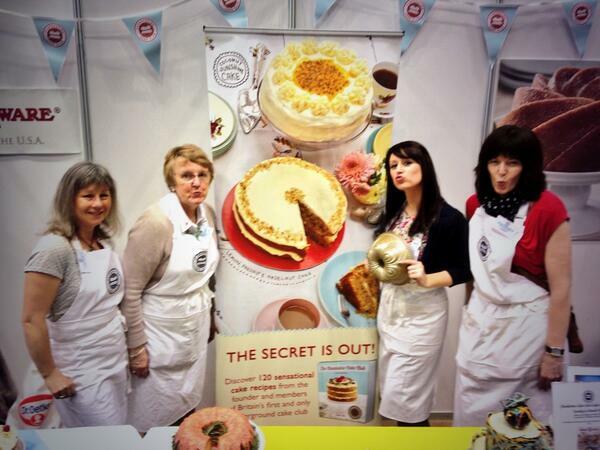 I was excited to be asked to help on the Clandestine Cake Club stand at the Cake & Bake Show Manchester 2014. 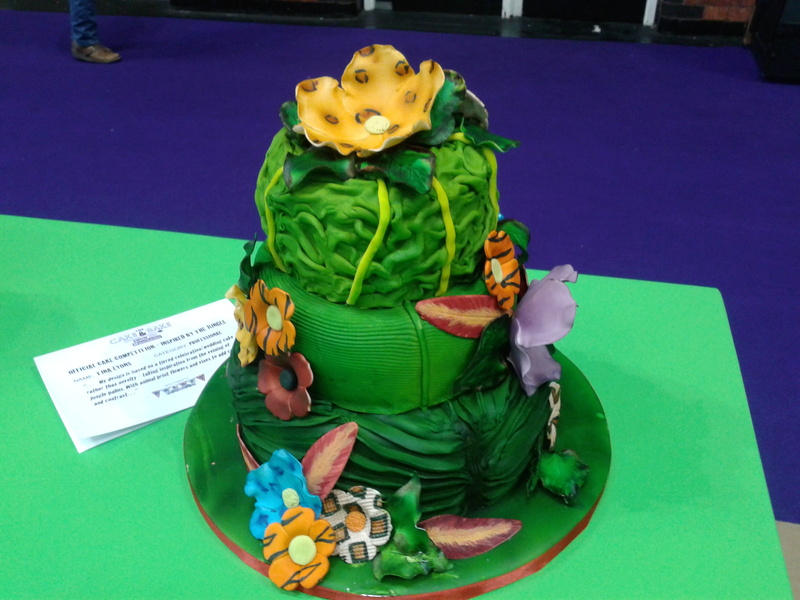 It is an amazing combination of cake & foodie suppliers stands, baking clubs and demonstrations by famous bakers like Peter Middleton, Frances Quinn from the #GBBO Great British Bake Off . 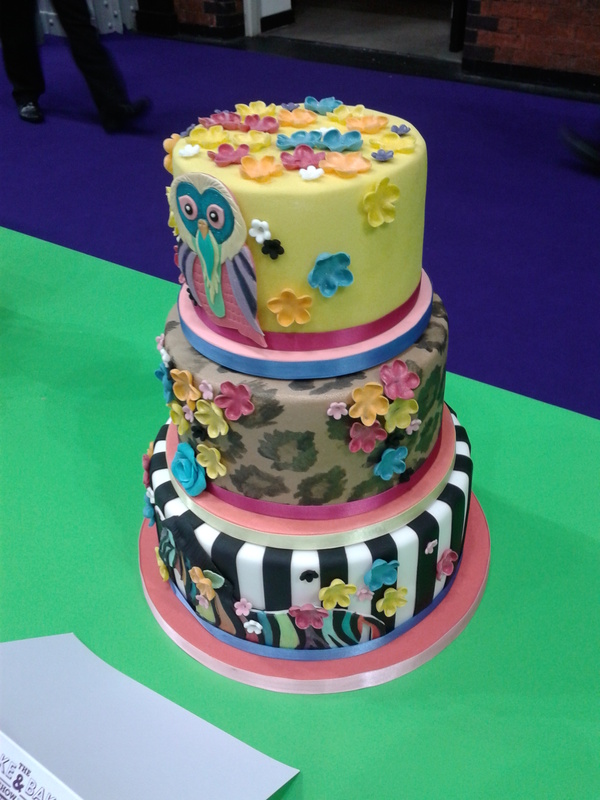 There were lots of opportunities to sample the cakes & learn tips on icing, sugarwork & prunes !! 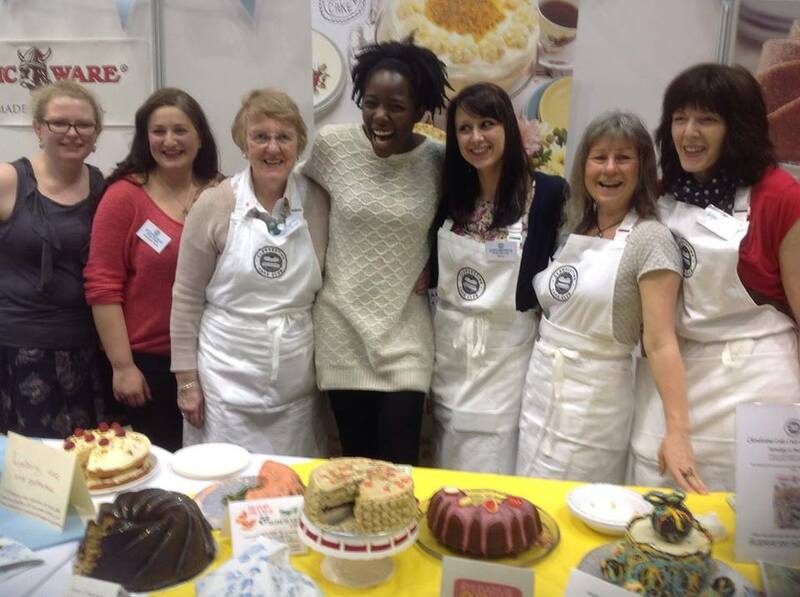 The CCC stand was busy all day with novice bakers looking to bake with others . We had a Bundt competition with 10 entries . 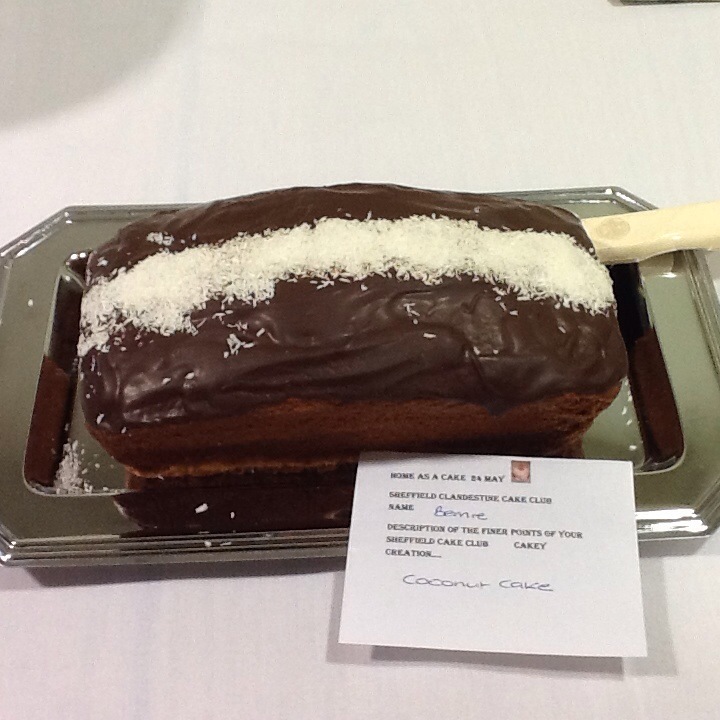 They were judged by @dollybakes ,the Bundt Queen , Rachel McGrath the Bolton group CCC organiser and Peter Middleton . 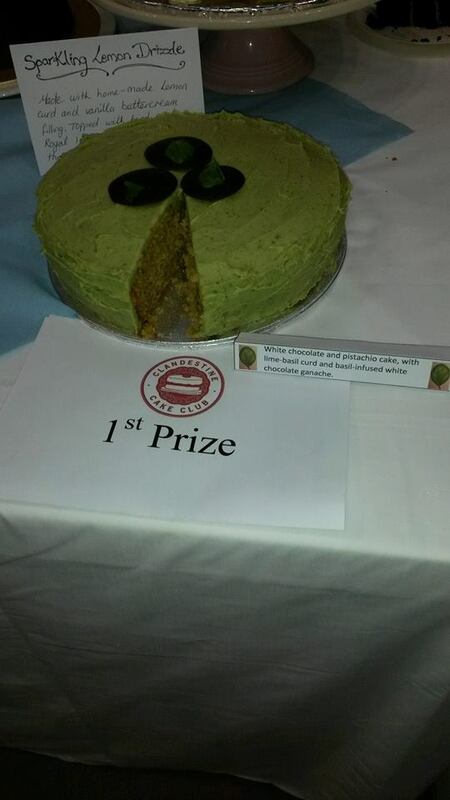 Health and safety rules meant no tasting by anyone but the judges …but I managed to scrump a bit of the winners …yummy !! 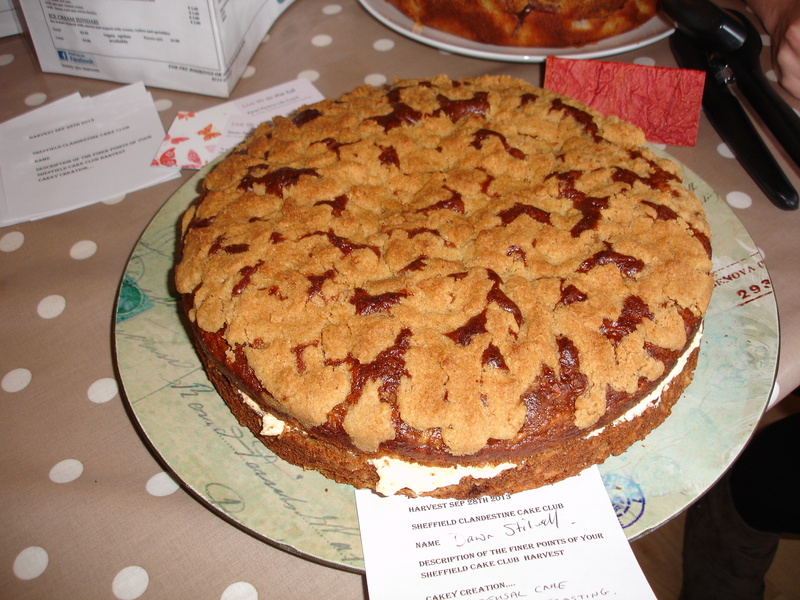 I am the Sheffield Clandestine Cake club organiser . Here are some action pictures from the day !! We are doing the Prune Pout !! 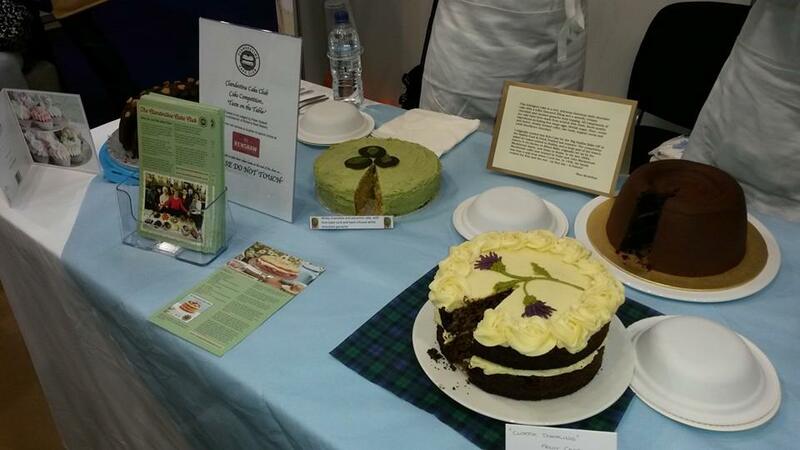 Cakes from Saturdays competition . 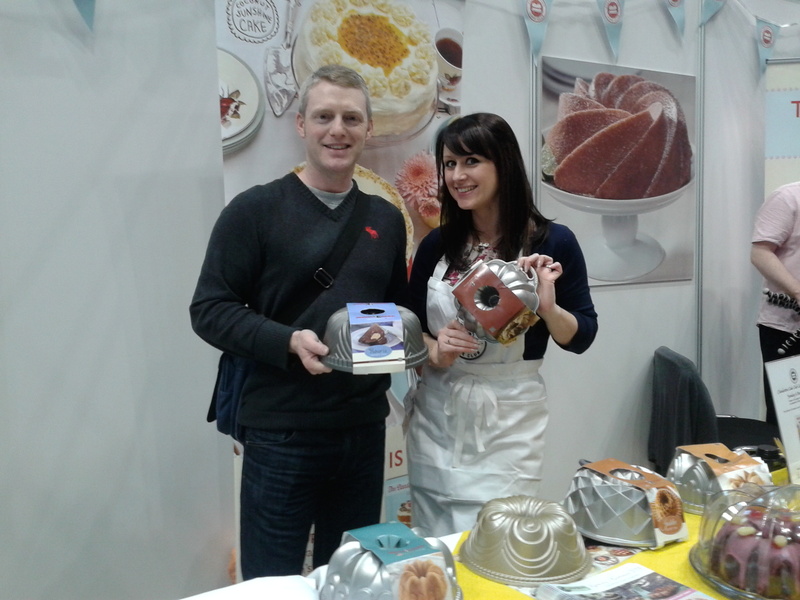 Meeting a real #GBBO competitor ! 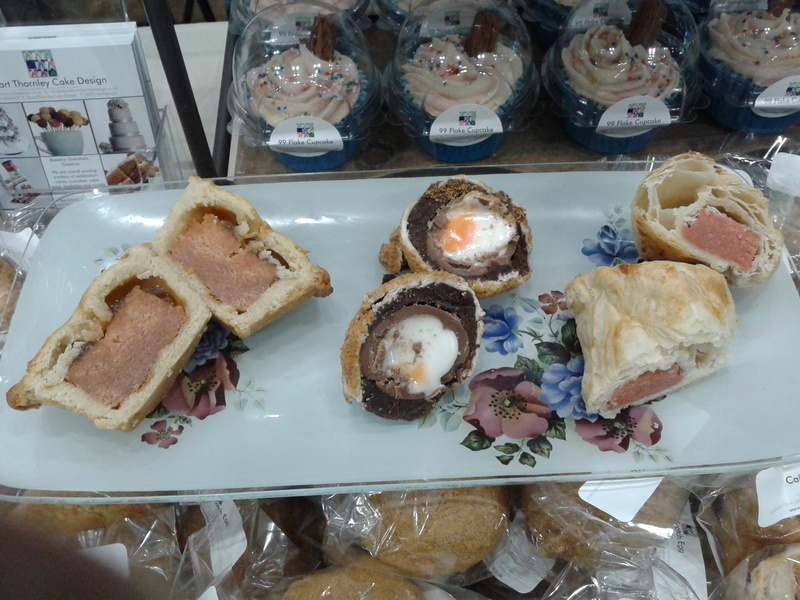 Cakes that look like savouries ! 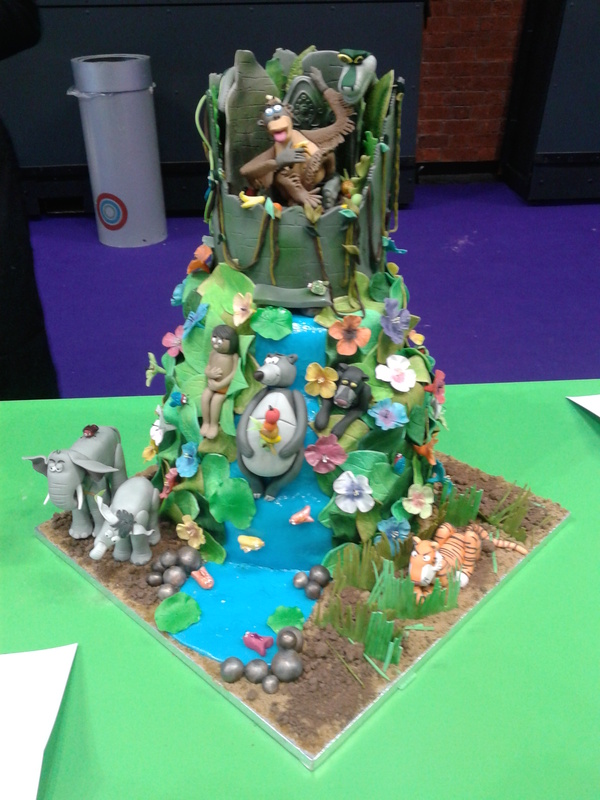 Competition cakes from the main Cake & Bake Jungle themed bakeoff . When is a pie not a pie? 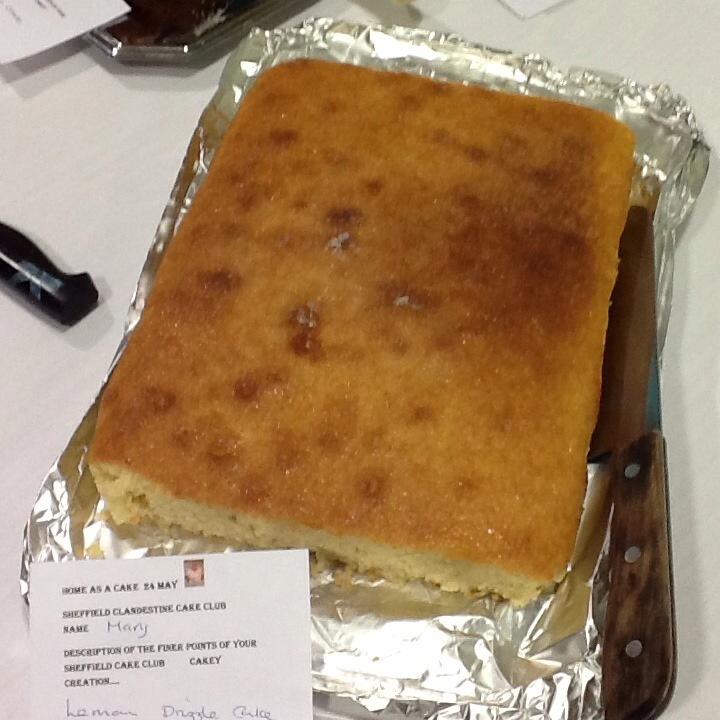 That was the conundrum posed by members of Sheffield Clandestine Cake Club at their last meeting… The answer: when it’s a cake! 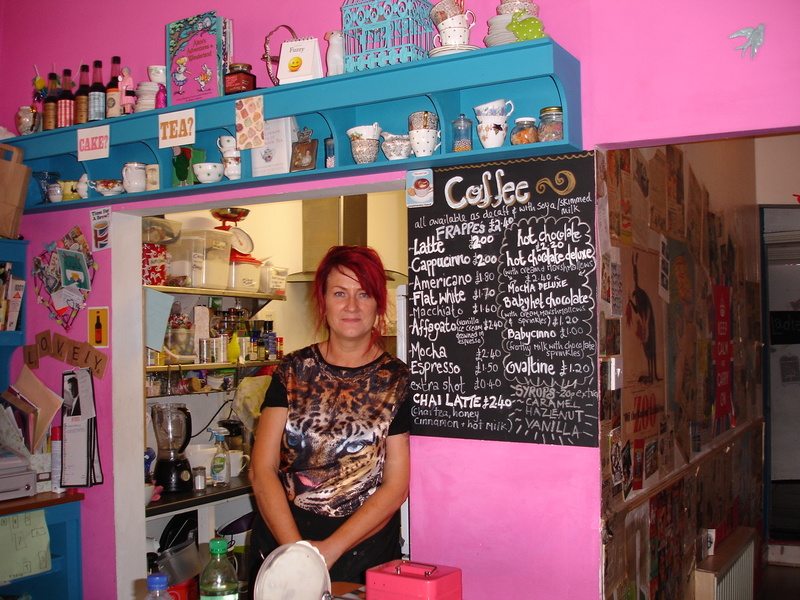 The secret location for the monthly meeting – revealed only once bakers had booked a place – was Bradleys café at the Nichols vintage crafts centre on Shalesmoor. 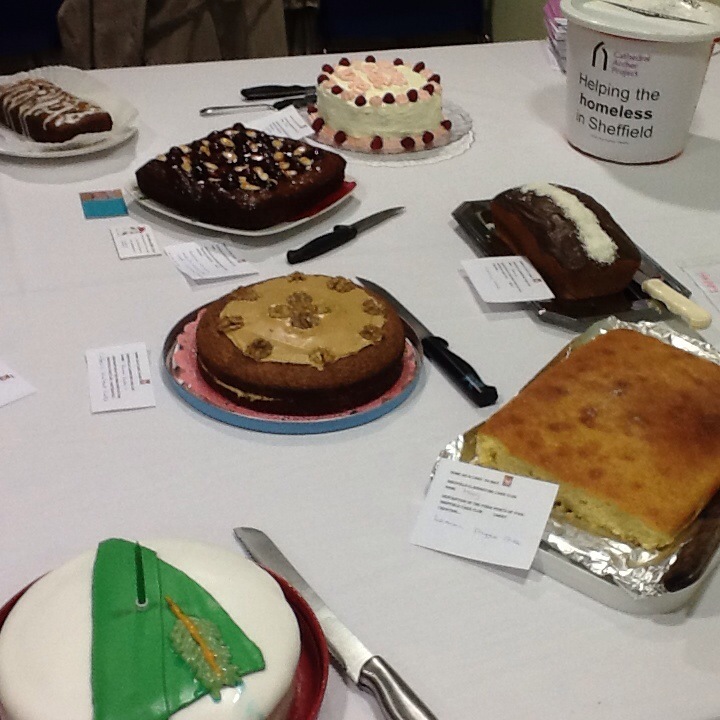 Around 20 bakers and their guests, of all ages and interests, turned up to chat, swap recipes and enjoy each other’s cakes. Organiser Karen Perkins says: “We have 120 members registered and we want more people to join us – including men who bake. Well behaved kids are welcome too. My name is Karen Perkins & my own recipe cake was a roasted hazelnut & almond cake, topped with home-made blackberry jam, whipped cream with blackberries & home made hazelnut & almond praline . I was surprised how easy the praline was , but take care with the hot sugar ! 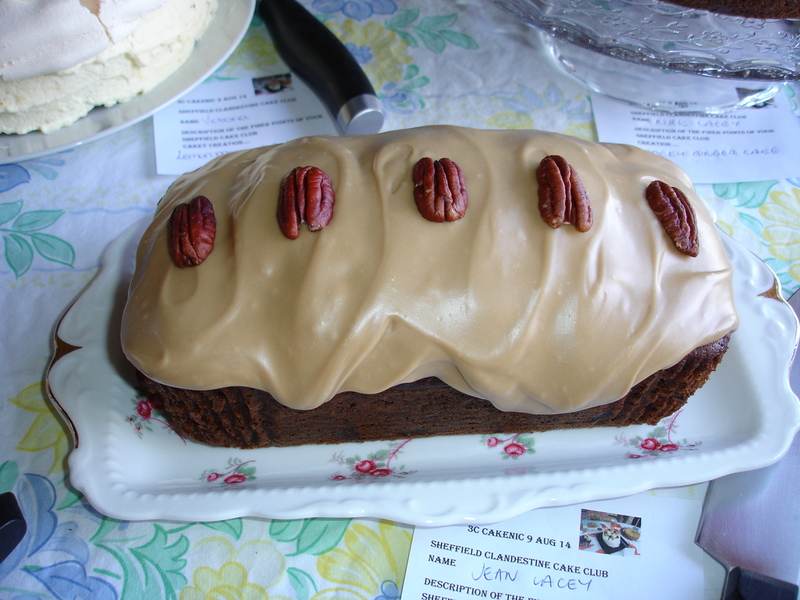 Follow me @Fabcoach on Twitter for dates & events from the Sheffield Clandestine cake Club. 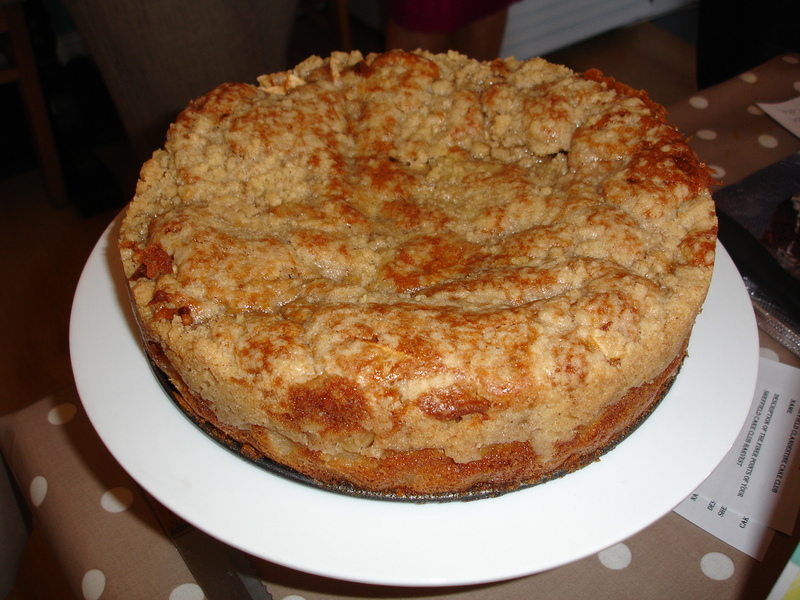 Alice made an apple & pear crumble cake. Fruit & seeds were popular ingredients in our autumn theme . 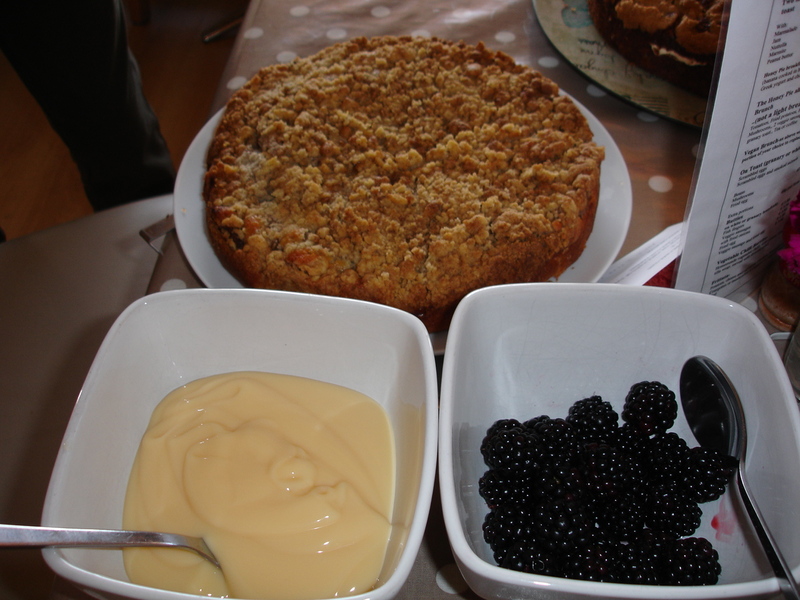 Dawns Streusel cake had Cinnamon & mixed spice streusel topping with fruit and a butter & salted caramel filling. Caramel frosting topped it off ! 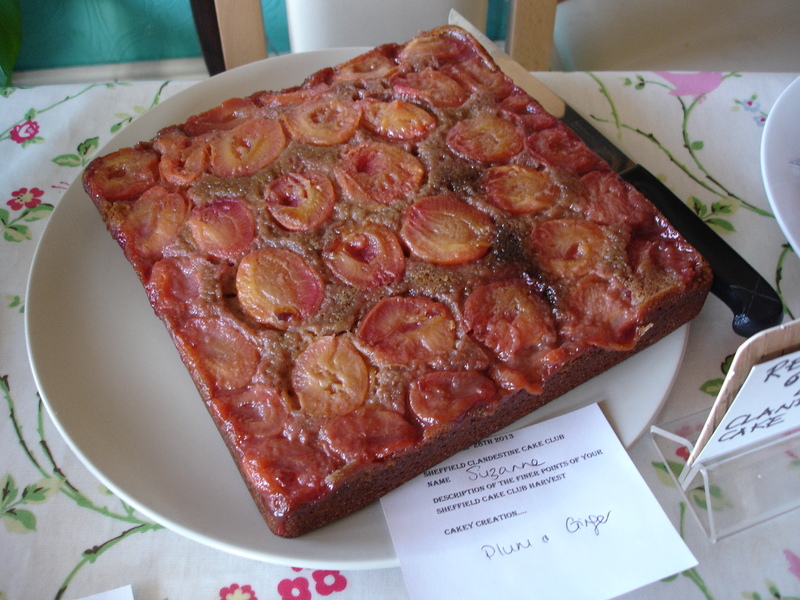 Plum & Ginger was the sticky yummy Autumn theme chosen by Suzanne ! 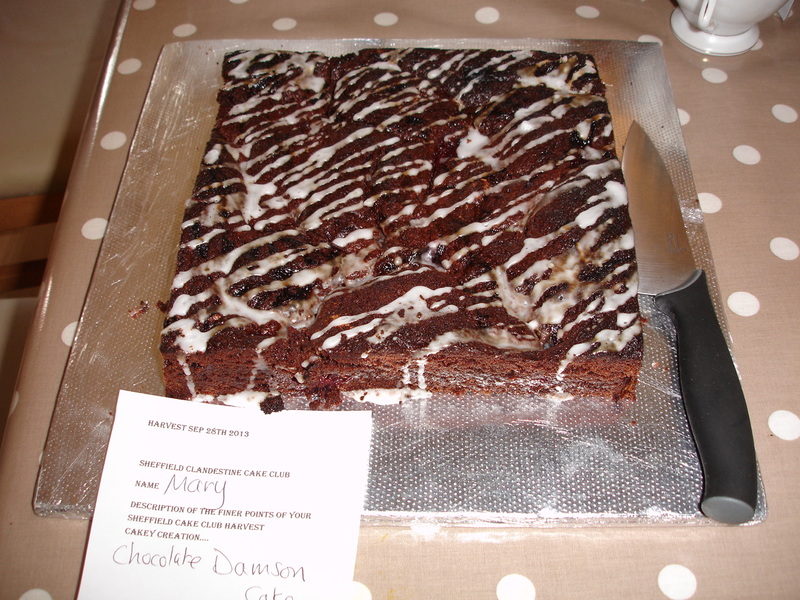 Mary’s chocolate & damson cake, one of Nigel Slaters finest ,had a soft mousse like centre . Pauls Apple & Cinnamon cake from the BBC Good food programme had moist apple inside. Bernie made an Orchard fruit cake with 4 whole apples and pears in. Very yummy and full of your 5 a day. 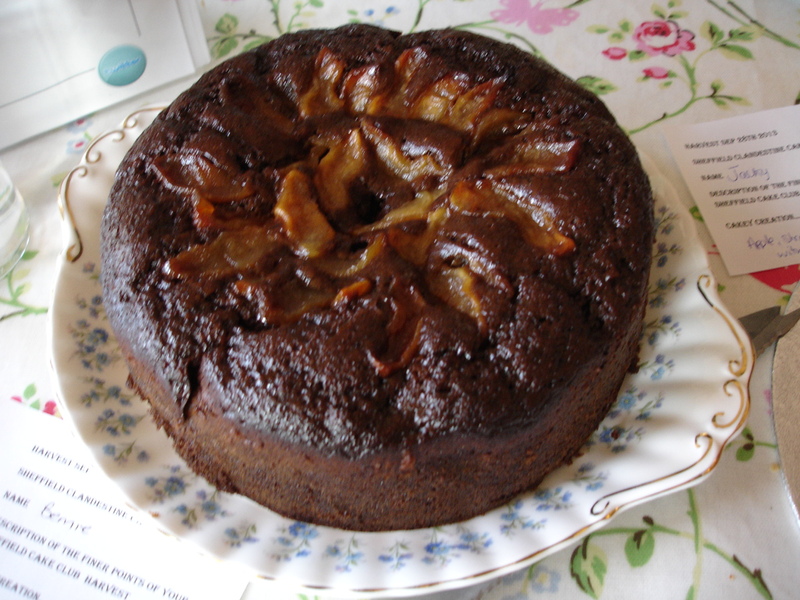 Karen W made a Maple Syrup & Apple cake with ginger . It was still warm #heaven. She suggests serving it with cream. 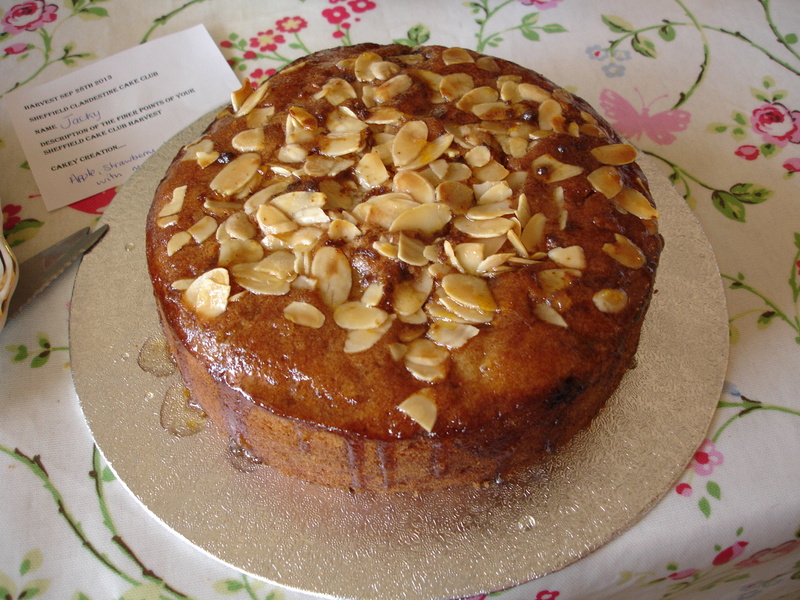 Jacky made an apple, strawberry & blueberry cake with a marmalade syrup glaze. Marthas cake came from the comedy thriller Drag me to Hell… following an internet search & had 1lb of grapes, slightly crushed plus olive oil instead of fat. It also contained fresh rosemary. Silvana baked a cheesecake from the Hummingbird bakery cookbook. It had homemade blackberry jam swirled in it. Final cake was a delicious Dutch Apple cake by Liz with massive apologies from me as I missed the photo. It was round with neatly circled apple slices and a shiny sticky glaze . 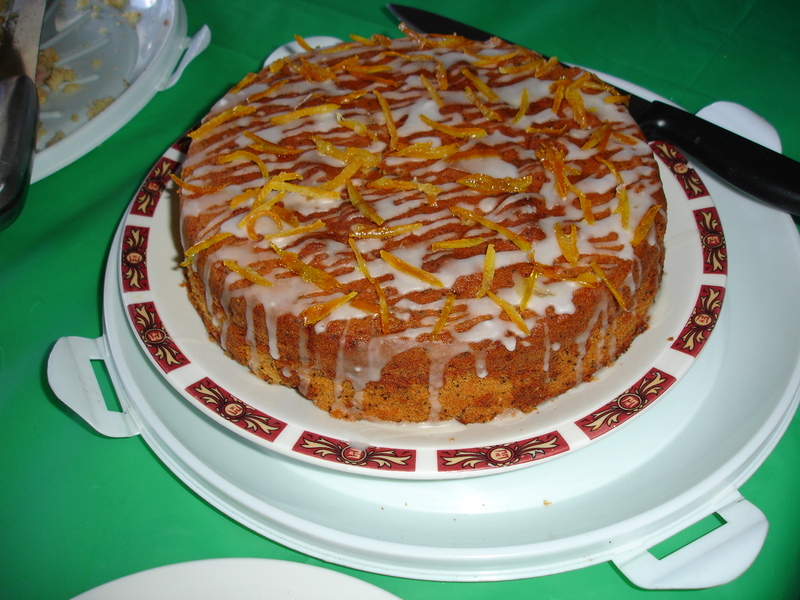 Sheffield Clandestine Cake Club – Cocktails and Mocktails. 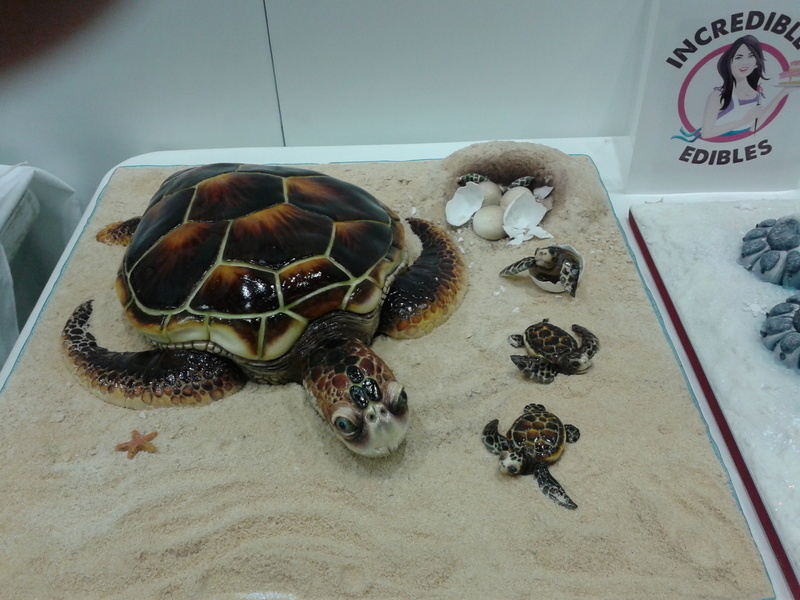 Look at the 19 cakes from our last event. 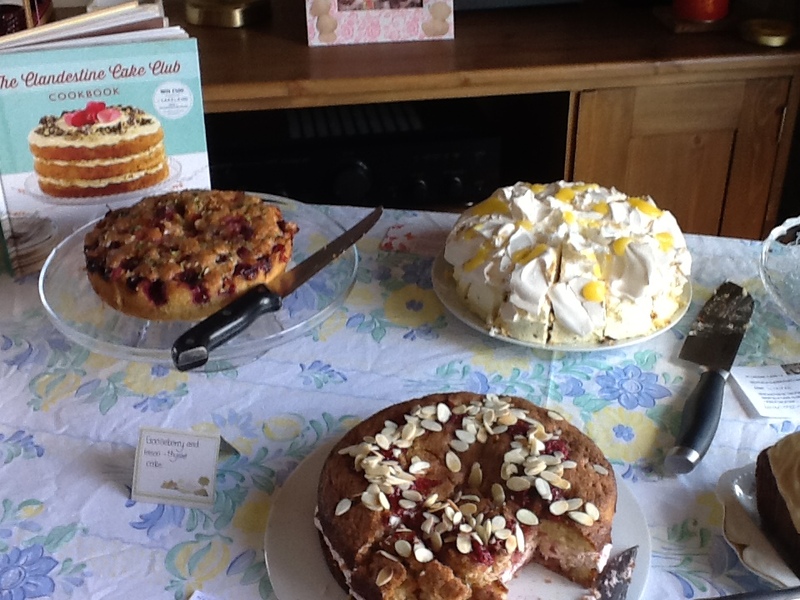 More to come every month …join via the www.clandestinecakeclub.co.uk website ..free to register ..and you get all the dates first !